Variant of biliopancreatic diversion with Roux-en-Y reconstruction. Objective To evaluate the safety and effectiveness of revisional bariatric surgery at a tertiary institution. Revisional bariatric operations for unsuccessful weight loss or intolerable complications following the primary intervention are increasing. Design Case series from a prospective database. Setting Tertiary bariatric referral center. Patients From 1995 to 2008, 56 patients who had been formerly operated on for clinically severe obesity underwent a revisional procedure at our institution. Their mean (SD) age and body mass index were 39.6 (9.6) years and 46.9 (16.4), respectively. They were divided into 3 groups according to the indications for reoperation: (1) unsatisfactory weight loss (n = 39), (2) severe nutritional complications (n = 15), and (3) intolerable adverse effects (n = 2). Main Outcome Measures Effectiveness of the procedures according to the indication of revision and overall morbidity and mortality rates. Results Mean (SD) follow-up was 102 (8) months. There was no mortality but there was an early morbidity rate of 33.9% due to postoperative complications, including 2 cases of acute renal failure (3.6%), 5 anastomotic leaks (13.1%), 8 cases of pneumonia (14.3%), and 1 case each of wound infection, incisional dehiscence, bile leak, and small-bowel obstruction (1.8%). Late complications included stenosis of the gastrojejunal anastomosis in 2 patients (3.6%), hypoalbuminemia in 2 patients (3.6%), and incisional herniation in 9 patients (16.1%). Late morbidity was 23.2%. Conclusion Although revisional bariatric surgery is associated with higher risk of perioperative complications compared with the primary procedures, it appears to be safe and effective when performed in experienced centers. 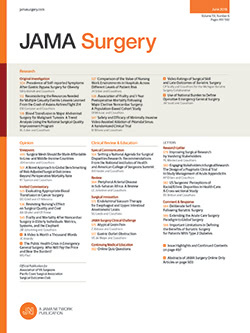 Clinically severe obesity is a severe epidemic for which surgical treatment is the only current effective approach for long-term success in terms of weight loss and resolution of severe comorbidities.1,2 During the last decade, there has been a marked increase in the number of bariatric operations performed annually,3 which coincides with the increased acceptance and demand of these procedures worldwide. The evolution of bariatric surgery has also led to a rapidly increasing demand for revisional bariatric procedures following the discontinuation of surgical techniques favored in the past that had unsuccessful weight loss results or other complications in the long-term.4,5 Nowadays, revisional bariatric surgery has emerged as a distinct entity, performed mainly in experienced centers to resolve mechanical complications and metabolic problems caused by the primary operation or to provide satisfactory weight loss. In this study, the experience with revisional bariatric surgery in a tertiary institution is reported with an attempt to define the major indications for revision and the perioperative and long-term morbidity and mortality as well as the surgical outcome. From June 1994, when the Nutrition Support and Morbid Obesity Unit of the Department of Surgery was established at the University Hospital of Patras, through November 2008, 1161 bariatric procedures were performed at our institution. Among them, 56 patients underwent a revisional operation. In 21 of these 56 patients (37.5%), the primary surgical procedure had been performed at our institution. All patients were operated on by a single surgeon (F.K.). All patients underwent a standard preoperative workup, including laboratory examinations, chest radiography, respiratory function tests, sleep apnea study, complete cardiologic and nutritional evaluation, upper gastrointestinal tract series, and, if needed, esophagogastroduodenoscopy. In cases of severe metabolic complications or malnutrition, artificial nutritional support was administered preoperatively. According to the indications for reoperation, the patients were divided into 3 groups: group 1, unsatisfactory weight loss; group 2, major metabolic complications; and group 3, intolerable adverse effects. Preoperative patient characteristics are presented in Table 1. Statistical analysis was conducted using SPSS (version 13.0; SPSS Inc, Chicago, Illinois). The variables measured on a continuous scale were compared using 2-sample t tests while nongaussian data were assessed using Wilcoxon rank sum tests. Pearson χ2 test or Fischer exact test was used for the investigation of difference in proportions in nominal data when necessary. Level of P < .05 was considered statistically significant. All values are expressed as mean (SD), unless otherwise defined. During a 13-year period, a total of 1161 bariatric procedures have been performed at our institution, among which 56 were revisional operations. Indications for revision were unsatisfactory weight loss in 39 patients (69.6%) (group 1), severe metabolic or nutritional complications in 15 patients (26.8%) (group 2), and intolerable adverse effects or mechanical complications in 2 patients (3.6%) (group 3). Revision or conversion to a variant of biliopancreatic diversion with Roux-en-Y reconstruction (BPD-RYGBP), which has been described in detail in a previous study6 (Figure), was the most frequent procedure and was performed in 35 patients (62.5%). Three patients (5.4%) underwent revision to standard RYGBP (STD-RYGBP); in 3 patients (5.4%), a partial gastrectomy with BPD (Scopinaro procedure) was the secondary operation; and 15 patients (26.7%) underwent elongation of the common limb at the expense of the biliopancreatic limb after a previously performed BPD. All procedures were performed by a single surgeon using standard laparotomy. The characteristics of all procedures are summarized in Table 2. The operative time ranged from 90 to 420 minutes (median, 210 minutes) while the mean postoperative hospital stay for all patients was 16.5 days (range, 7-78 days). There was no early or late mortality. However, serious complications developed in 19 patients resulting in an early morbidity rate of 33.9%. Leakage from the gastrojejunal anastomosis occurred in 5 of 38 patients in whom it was performed (13.1%), resulting in subphrenic collections in 3 cases, which were successfully drained under computed tomography observance. One patient developed clinical signs of septic shock and after hemodynamic stabilization underwent exploratory laparotomy for surgical draining. Other serious early complications included 8 cases of pneumonia (14.3%), 1 of which was attributed to aspiration; 1 case of wound infection (1.8%); and 1 case each of trauma dehiscence, bile leak, and small-bowel obstruction documented during the first postoperative month. All these patients were treated conservatively. Late complications included 9 patients with incisional hernias (16.1%) and 2 patients with clinical and laboratory signs of hypoalbuminemia (3.6%) diagnosed during the first postoperative year who were treated successfully with oral nutritional supplements and dietary instructions with no need for artificial nutrition support. No recurrence has been documented since. Two patients experienced symptoms of gastric obstruction due to stenosis of the gastrojejunal anastomosis in the sixth and ninth postoperative months, respectively. Endoscopic balloon dilation of the stenotic anastomosis resolved the problem successfully in both cases. Late morbidity rate was 23.2%. The results are summarized in Table 3. Unsatisfactory weight loss was the indication for revisional bariatric surgery in 39 patients (69.6%). The initial failed procedure included vertical banded gastroplasty in 22 cases (56.4%), horizontal gastroplasty in 1 case (2.6%), gastric banding in 13 patients (33.3%), and STD-RYGBP in 3 patients (7.7%). Staple-line disruption was the cause of surgical failure in the cases of vertical banded and horizontal gastroplasties as well as in 3 patients who underwent STD-RYGBP in the beginning of our series, while band slippage was frequent in the group of patients who had previously undergone gastric banding. Mean (SD) follow-up in this subgroup of patients was 98 (5) months. A statistically significant decrease in body mass index (calculated as weight in kilograms divided by height in meters squared) was observed (mean [SD], 35 [5.33] compared with preoperative value of 55.4 [12.5]; P < .05), while mean percentage of excess weight loss was 68.9% (range, 57.17%-111.89%) (Table 4). The overall success rate estimated by percentage of excess weight loss was not statistically different among the group of patients who underwent the 3 different types of malabsorptive secondary operations, but because of the small statistical sampling, these results might not be meaningful. Revisional surgery was necessary in 15 patients for protein malnutrition following BPD-RYGBP, which had been performed at our institution in all cases. This patient group represented 2.2% of all cases of hypoalbuminemia recorded after this type of operation in our series (35 patients among 682 BPDs performed; total, 5.13%). All patients experienced severe and persistent symptoms, with a mean albumin level of 2.28 g/dL (range, 1.8-2.7 g/dL) (to convert to grams per liter, multiply by 10), and despite repetitive attempts of artificial nutritional support, their nutritional status could not be corrected and a secondary operation was decided. The surgical procedure included elongation of the common limb by 100 cm at the expense of the biliopancreatic limb by creating a new entero-enteric anastomosis to achieve better protein absorption in all 15 cases. There were no complications recorded. Mean (SD) follow-up in this group of patients was 65 (7) months, with total resolution of all clinical signs and symptoms of hypoalbuminemia (mean [SD] albumin level of 3.5 [0.9] g/dL; P < .05). On the other hand, there was some weight regain following the revisional procedure, which was not statistically significant (P = .24), and all patients were satisfied by the final outcome. Two of the 56 patients underwent a revisional procedure for intolerable mechanical complications after the initial operation. Stomal obstruction diagnosed 6 months after a previously performed STD-RYGBP, most likely due to ischemia of the Roux limb, was the cause of severe malnutrition and dehydration in 1 patient. The second patient in this group presented with serious stomal stenosis due to recalcitrant stomal ulcer following BPD-RYGBP that had been performed 2 years before. Neither patient was eligible for endoscopic balloon dilatation and both underwent conversion to a Scopinaro procedure with favorable outcomes. The incidence of reoperation in bariatric surgery has been reported to be 5% to 56%5,7 while in our center these procedures accounted for 5% of all operations, reflecting some of our patients and others referred to our institution. Inadequate initial or sustained weight loss after the primary operation was the most common indication for revision in our series. Vertical banded gastroplasty and gastric banding was the initial failed procedure in 90% of this patient group. Although the popularity of stomach-stapling operations dropped off 10 years ago and these operations are no longer performed, the volume of revisions after previously performed gastroplasties has not declined over our study period. Therefore, these procedures, along with the more recently applied gastric banding, still remain a challenging clinical problem when performing reoperation. Revision to a malabsorptive procedure was performed in all cases in our series, with a variant of BPD-RYGBP6 reconstruction representing the most frequently performed secondary procedure. Although purely restrictive operations have been reported as options in revisional bariatric surgery,8,9 disappointing data regarding these rescue procedures have already been reported.10 Roux-en-Y gastric bypass or BPD seems to be the most effective revisional procedure for inadequate weight loss, as demonstrated in this study and others.11-15 The efficiency of the operation is based on the feeling of early induced satiety and primarily on malabsorptive mechanisms along with alteration at the secretion of several gastrointestinal hormones, such as plasma ghrelin, glucagon-like peptide 1, peptide YY 33-36, and oxyntomodulin.16,17 In our series, clinical and laboratory data after 7 years of follow-up confirm the success of BPD-RYGBP6 in terms of excess weight loss (percentage of excess weight loss), which was 70% or more in 92% of patients who underwent this variant of BPD. This procedure is associated with better weight loss and less dietary restriction than seen following restrictive procedures, with corresponding improvement of major coexisting comorbidities. Therefore, it could be considered an excellent alternative after failed conventional malabsorptive operations, such as STD-RYGBP. Revisional bariatric surgery for severe metabolic and nutritional complications is typically performed after previous malabsorptive procedures. In our series, 2.2% of patients with hypoalbuminemia after the previously performed bariatric operation experienced persistent protein malnutrition that required revisional surgery. These patients represented the second largest group in need of surgical reintervention. All of them had been formerly operated on at our institution and had undergone a variant of BPD-RYGBP.6 Although no statistically significant difference between this procedure and RYGBP has been demonstrated in the incidence of nutritional deficiencies,18,19 persisting hypoalbuminemia was evident in these patients even after repetitive attempts of artificial nutrition support. Thus, revision surgery with elongation of the common limb at the expense of the biliopancreatic limb to achieve better protein absorption was decided and performed in all cases, with favorable results. Since its early onset nearly 50 years ago, bariatric surgery has demonstrated numerous surgical approaches for the treatment of clinically severe obesity. The past is rife with failed operations with serious postoperative complications or insufficient weight loss, such as the jejunoileal bypass or the more recent stapled gastroplasties. Roux-en-Y gastric bypass, adjustable gastric banding, and the recent sleeve gastrectomy represent the most modern modalities in bariatric surgery, the first of which has been acknowledged as the “gold standard” in the treatment of clinically severe obesity. The accelerated growth of bariatric surgery during the last decade31 has led to a proportional increase of bariatric revisions worldwide. As improvements in technique and instrumentation take place in this surgical field, along with the novel compelling application of bariatric surgery in the treatment of severe metabolic disorders,32 it is very likely that revision rates of both failed operations of the past and currently popular procedures will increase considerably in the near future. Nonetheless, despite the higher demand for these procedures, not every surgeon should perform reoperations.33 Revisional bariatric operations require experienced surgeons and well-organized “centers of excellence”34 in order to use the technological innovations and the human experience for the patient's best interest.35 New concepts and improved techniques by well-trained surgeons in properly organized institutions coupled with cautious patient selection represent the cornerstone for achieving favorable results and for extending patients' longevity. Correspondence: Fotis Kalfarentzos, MD, Department of Surgery, School of Medicine, University of Patras, Greece, Platia Voriou Ipirou 5, Patras 26441, Greece (fkalfar@med.upatras.gr). Accepted for Publication: March 15, 2009. Author Contributions:Study concept and design: Kalfarentzos. Acquisition of data: Spyropoulos, Kehagias, Panagiotopoulos, and Mead. Analysis and interpretation of data: Spyropoulos, Kehagias, and Panagiotopoulos. Drafting of the manuscript: Spyropoulos, Kehagias, Panagiotopoulos, Mead, and Kalfarentzos. Critical revision of the manuscript for important intellectual content: Mead. Statistical analysis: Spyropoulos, Kehagias, and Panagiotopoulos. Study supervision: Mead and Kalfarentzos.